By 10:15am, you must arrive at the Golden Tours Visitor Centre in Victoria to collect your tickets for Buckingham Palace. You will then be escorted by a member of Golden Tours staff to Buckingham Palace, where you will be able to enter the Palace at 10:45am. Meeting Point: Golden Tours Victoria Visitor Centre, 4 Fountain Square, 123-151 Buckingham Palace Road, London, SW1W 9SH. 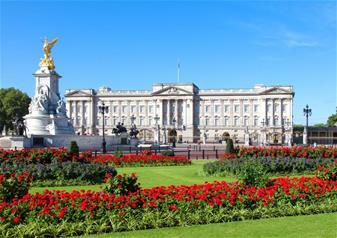 A typical visit to Buckingham Palace lasts between 2 and 2½ hours. Departure point: You can join the tour from any of our 60 stops. Each of our stops will be clearly signposted Golden Tours Hop on Hop Off/London Tour Bus. There is a stop outside the entrance to Buckingham Palace. Experience the best London has to offer with this excellent package that allows you to see one London’s most iconic landmarks combined with the freedom to explore the city. The beautiful royal residence and working establishment of Buckingham Palace is certainly a must-see for any visit to London. A total of 19 State Rooms are open to the public, filled with some of the greatest treasures of The Royal Collection – an incredible display of priceless art and sculpture, set alongside opulent and antique English and French furniture. New for Summer Opening in 2017, this stunning exhibition tells the story of Her Majesty the Queen’s 65 year reign through the display of a wide-ranging selection of official gifts. Featuring ornate items that represent every continent and displaying the most beautiful craftsmanship from across the globe, inspect spectacular gifts presented to the Queen from world leaders such as President Eisenhower, Nelson Mandela and President Xi Jinping of the People’s Republic of China. The Buckingham Palace gardens are often described as a ‘walled oasis in the middle of London’. Home to more than 350 types of wildflowers in 42 acres of idyllic greenery, this is a truly splendid part of the visit. There are audio guides available in the following languages: English, French, German, Spanish, Italian, Japanese, Chinese, Russian and Brazilian Portuguese. After the palace, explore the incredible sights and sounds of London on a hop-on hop-off open-top bus tour. you’ll have a surplus of time and freedom to see everything London has to offer – jump on and off at your leisure throughout the two days. With 60 stops, across four routes that cover all the main tourist sites in London, see the most iconic of London landmarks such as The London Eye, Tower Bridge, The Tower of London, Westminster Abbey, Big Ben and the Houses of Parliament. Exploring London on foot is one of the best ways to see the city on ground level! Led by an experienced guide, discover the Royal Family’s favourite places in the capital or see where The Beatles worked and played. All customers must visit the Golden Tours Visitor Centre in Victoria (check-in time 10:15am), to collect your tickets for Buckingham Palace. You will then be escorted by a member of Golden Tours staff to Buckingham Palace, where you will be able to enter the Palace at 10:45am. Tickets cannot be amended or cancelled once booked. Clients that require mobility access must book by calling (+44) (0) 303 123 7324. Tickets purchased from Golden Tours cannot be converted into a 1-Year Pass. *Valid for 24 hours from when you first hop-on the boat. Unlimited usage within the 24 hours. Only to be used between Westminster Pier and St Katharine’s Pier.